If you want to enjoy the charming beauty of Halong Bay at its best, there is no better way than going on a cruise. Among a large number of cruises in Halong, Paradise Cruises, which specializes in providing various choices of cruise to better serve the needs of travelers going sightseeing in this beautiful bay, is one of the most prestigious cruises in Halong Bay. 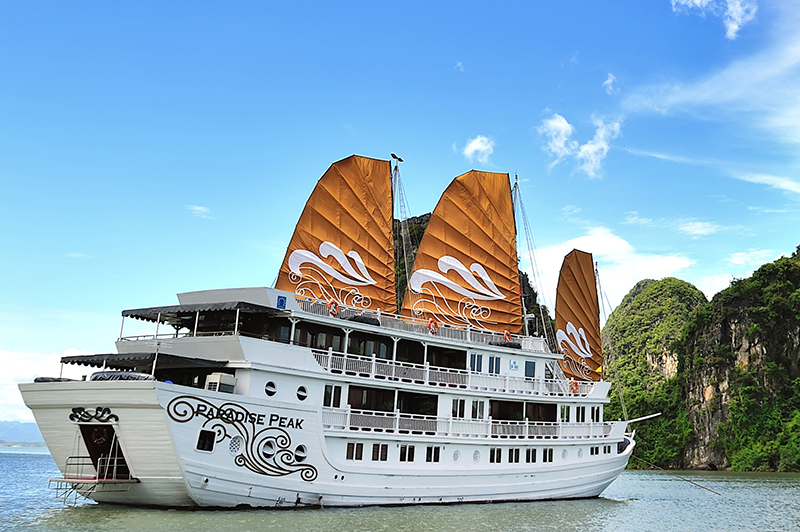 It is not exaggerating to say that Paradise Cruise Halong is the perfect choice for a day in Halong Bay! Don’t miss a chance to experience with Halong Bay Junk Cruise ! It offers four options for travelers including Paradise Explorer, Paradise Peak, Paradise Privilege and Paradise Luxury. Halong Paradise Luxury Cruise is always the best choice for those who want to truly immerse themselves in the beauty of majestic caves and pristine beaches. There are 4 different vessels numbered I, II, III, IV with 68 luxurious suites and cabins in the system of Paradise Luxury. Designed in a traditional Vietnam junk’s style, these cruises are beautifully decorated with a lavish outfit blending in harmony with nature. All of them own dimensions of 11.5 meter high, 9 meter wide and 41.5 meter long. 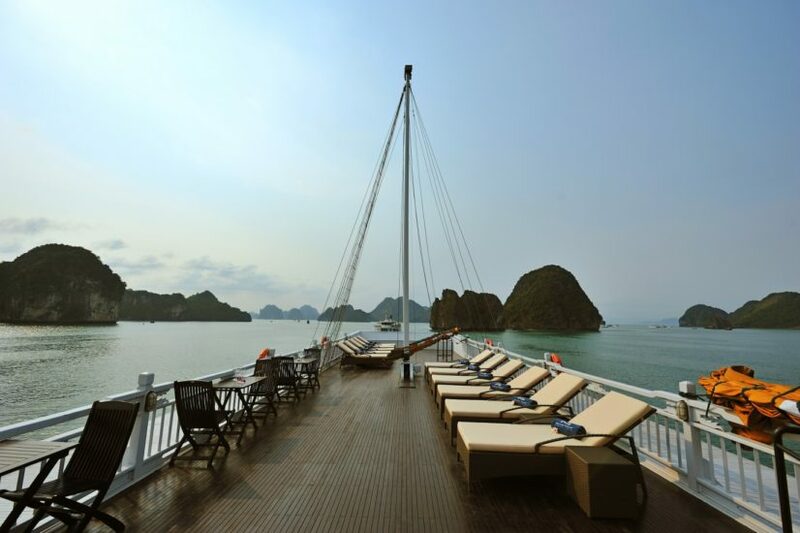 Standing on the first deck, you will catch an amazing view to enjoy the fresh and cool atmosphere and the magnificent beauty of blue sea and sky of Halong Bay. Moreover, each vessel on the third deck will have a stylish bar and restaurant to serve the dining needs of all travelers. Generally, thanks to the modern and luxurious amenities fully equipped in each room, Paradise Luxury Cruise can satisfy even the most discerning tourists. There are 17 cabins with 4 options available including terrace suites, paradise suites, deluxe balcony cabins and deluxe cabins in each Paradise Luxury. 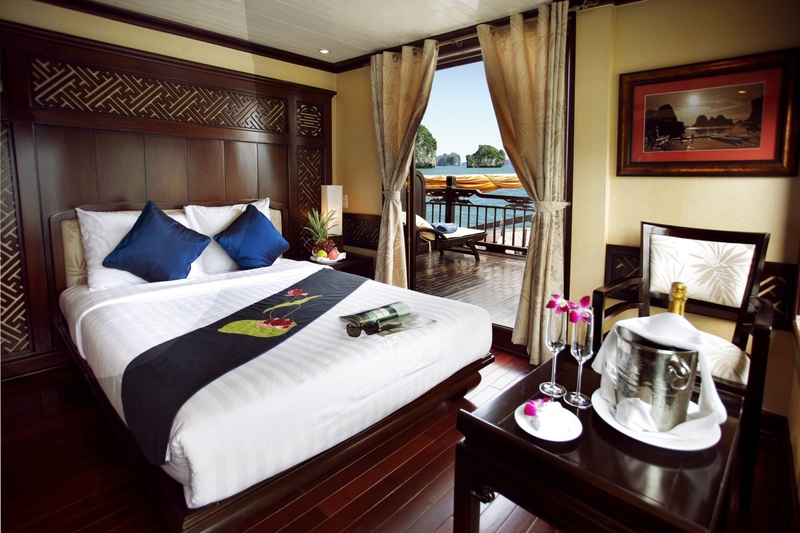 With the goal of providing guests with the best view to immerse in the natural environment during the cruise, all rooms onboard Halong Bay Paradise Luxury Cruise are heavenly windows onto the impressive beauty of nature. In general, cabins, each of which is equipped with modern amenities such as personal safe, bath linen, wardrobe, fire extinguisher, en-suite bathrooms, central air-conditioning adjustable individually, complimentary mineral water and so on, are designed to accommodate two adults and one child under 12 years old. A terrace suite or a paradise suite is your best choice if you prefer a large space, having the total area of 23 m2. On the other hand, a deluxe balcony cabin (18m2) or a deluxe cabin (16m2) may be suitable for you if you like a smaller one to experience the warm atmosphere. 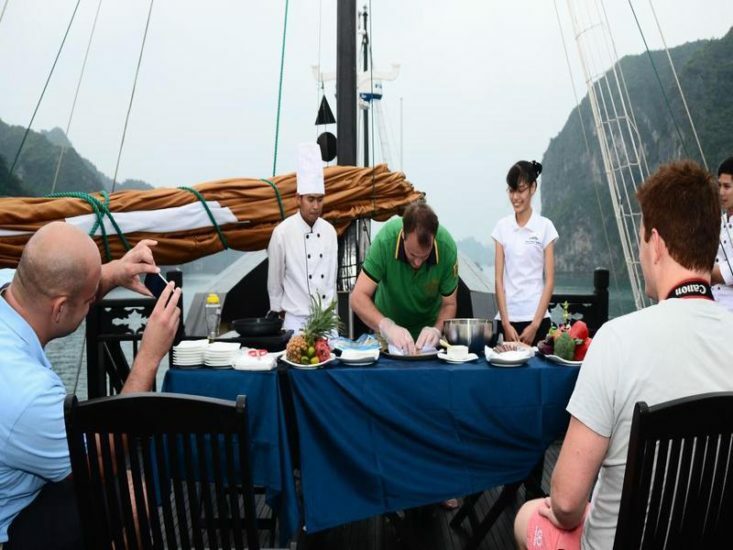 Paradise Luxury, which is well known as one of the most luxury cruises in Halong Bay, offers travelers a wide variety of services such as fresh flower, bar & restaurant, spa and massage, cabin service, laundry service, library, boutique shop and baby cot. Offering various options for you to choose, spa service here can satisfy all types of guests whether they are women or men and old or young. Traditional Vietnamese massage, Western reflexology, traditional Thai massage, aromatherapy massage, facial beauty care, waxing, etc are some types of spa services for your reference. In addition to spa services, restaurant and bar are the other highlighted features of Paradise Luxury Cruise. Situated on the third deck, restaurant and bar are a place where groups of tourists can gather, talk happily while enjoying foods and drinks together. 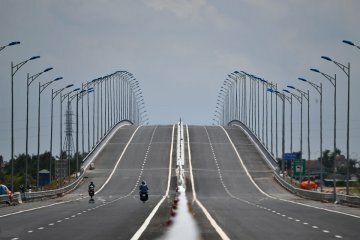 They are also a pretty place where you can easily make friends with other travelers from different places in the world. Here, dishes served are made in harmonious combination of European – Vietnamese style and the latest culinary trends from all around the world. Moreover, you will also enjoy sumptuous buffets in the very luxurious and elegant atmosphere of the restaurant. In general, various itineraries of Paradise Cruise will offer various activities for guests. However, there are some common activities like wooden games, cooking classes, movie nights, kayaking, snorkeling, cycling, fishing and swimming. In addition, in Cave program, you will have a great chance to taste various food options in Dinner and BBQ dinner.